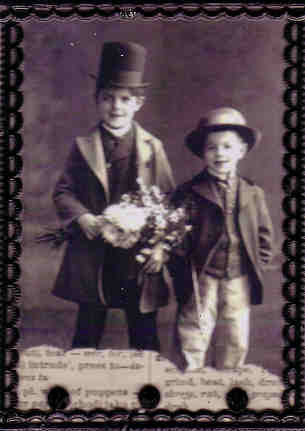 Gallery Click on an image to enlarge! 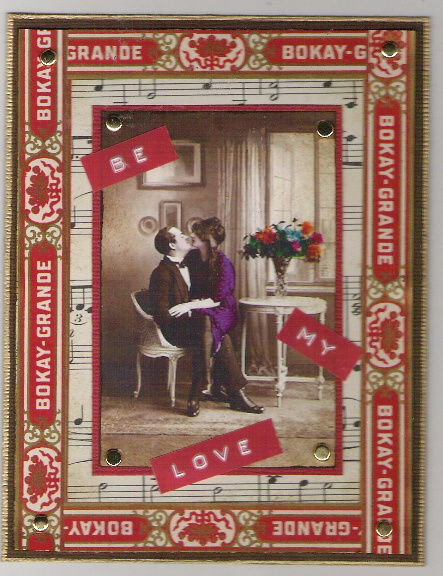 This card uses items from the Couples Collage Sheet, vintage sheet music and cigar trim labels. This altered mini-composition notebook uses an image from the Beauties Collage Sheet. 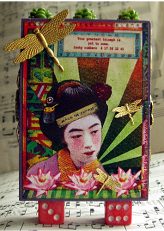 This ATC uses an image from the Little Ones collage sheet and vintage sheet music. 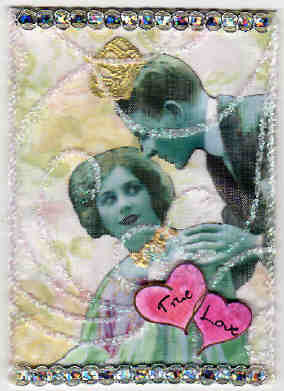 This ATC uses a photo from the Couples Minis Collage Sheet. 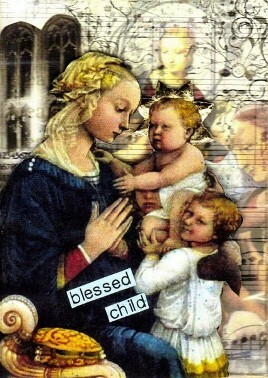 This ATC uses a photo from the Little Ones Collage Sheet. Subbmitted by Joyce Ryder. Click above to join the Collage Stuff Yahoo! Group; a place for ATC swaps, a low volume mailing list announcing new items and members only specials! 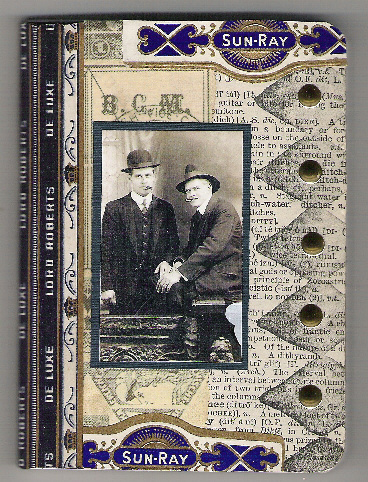 This altered mini-composition notebook uses an image from the Money Matters Collage Sheet, vintage cigar trim labels, and cigar band labels. 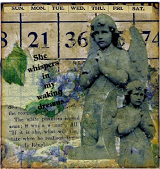 These LFB (little fat book) pages use images from the Cemetery Angels collage sheet. Bingo cards make great backgrounds for all sorts of projects. These samples use napkins, vintage book pages, foil stars and mica flakes. 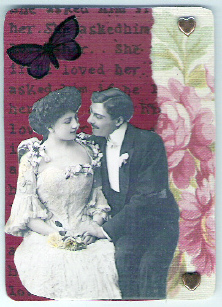 This ATC uses an image from the Couples collage sheet and the Stylish Background Stamp. Submitted by Joyce Ryder. 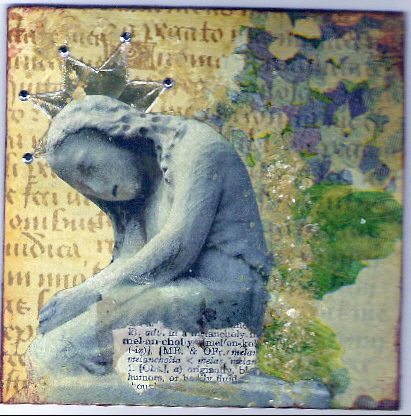 This ATC uses images from the Cemetry Angels #4 collage sheet, a background stamp from the UM Sheet 4B and "tin types" alphabet stickers!! 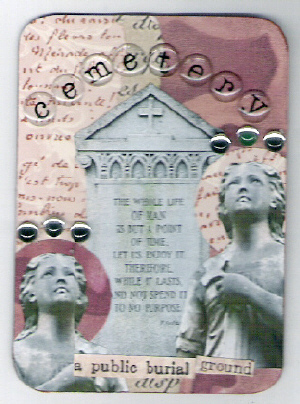 These ATC's use images from the various Cemetery Angels collage sheets. Submitted by Corien v/d Oever, the Netherlands. 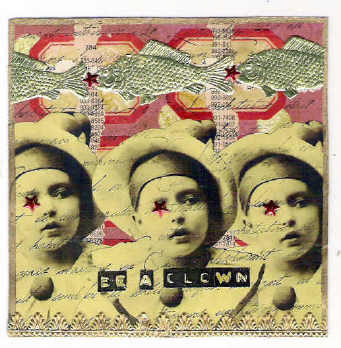 This ATC uses an image from the Circus Fun collage sheet and the Playful Rubber Stamp. Submitted by Nancy Clites. 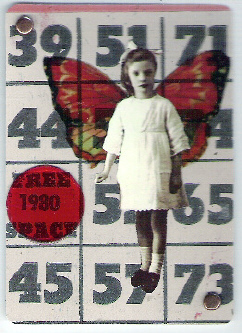 This ATC uses an image from the Little Ones collage sheet, a vintage bingo card, a bingo marker, and a butterlfy from the Flutter Transparency. Submitted by Nancy Clites. 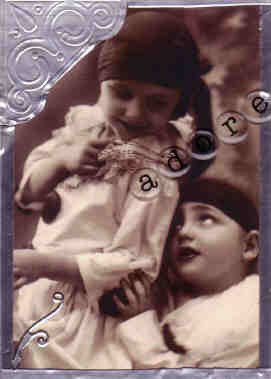 This ATC uses an image from the a Vintage French Postcard, the Love ? rubber stamp, and an image from the Flutter Transparency. This little fat book page uses an image from the "Fabulous Faces" collage sheet! 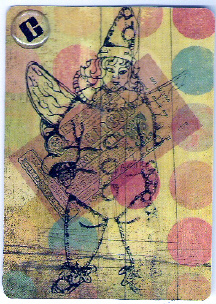 This ATC uses the Time and Time Again rubber stamp, the Wish and 123 rubber stamps from the Plate 9A rubber stamp sheet. 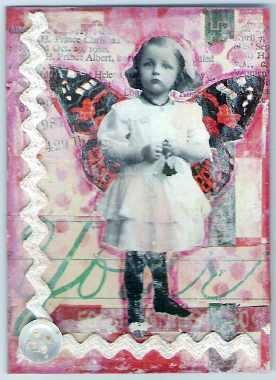 This ATC uses an image from the Always Adorable collage sheet, the Stylish Background rubber stamp, and vintage book pages. 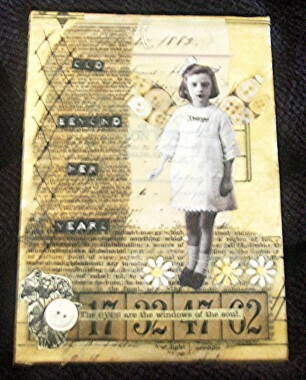 This 5 x 7" canvas beeswax collage uses an image from the Little Ones collage sheet, vintage books pages, mother-of-pearl buttons, black millinery netting and a vintage bingo card. 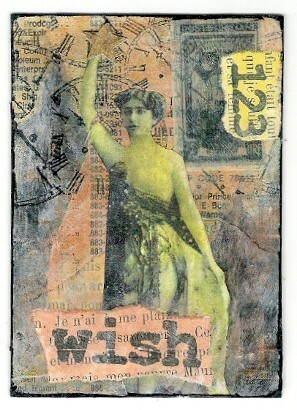 This ATC uses an image from the Things Western collage sheet and vintage cigar trim labels. 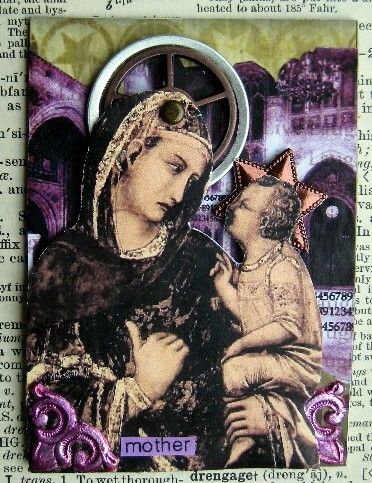 This ATC uses an image from the Adorable Always collage sheet, vintage white rick rack, and a mother of pearl button. 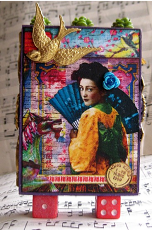 This little fat book page uses an image from the Clowing Around collage sheet and the gold Reniassance German scrap border. 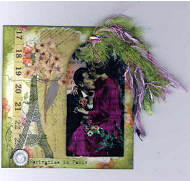 This little fat book pages uses images from the So Happy Together collage sheet and the Vintage Paris collage sheet. This ATC by Marcy Hudziak uses an image from the Clowing Around collage sheet and a label from the Art Words collage sheet. 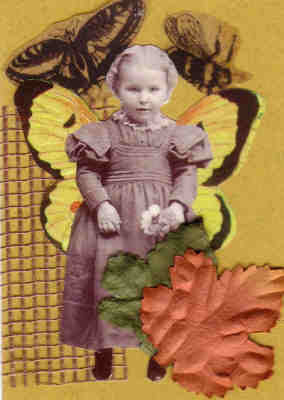 Debby Boltman used an image from the Clowing Around Collage Sheet and Typewriter Tin Types for this ATC! 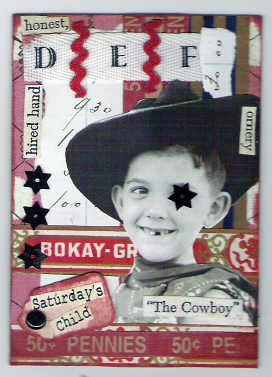 Debby Boltman used an image from the Meagan collage sheet for this ATC! 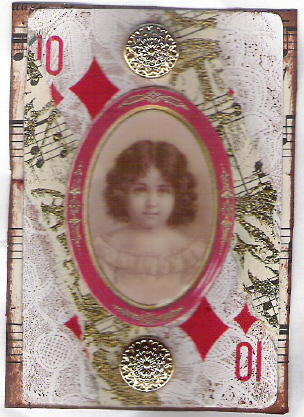 Debby Boltman used an image from the Samantha collage sheet, white vintage rick rack and a red bingo marker for this ATC! 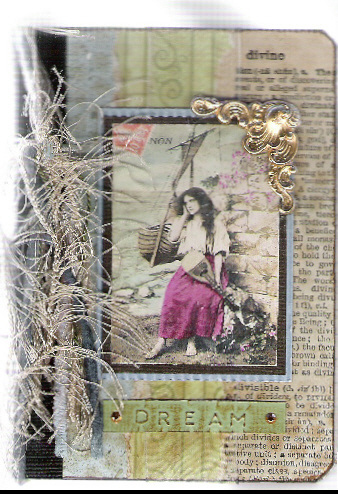 Debby Boltman used an image from the Adorable Always collage sheet, and the black lace German scrap border for this ATC! 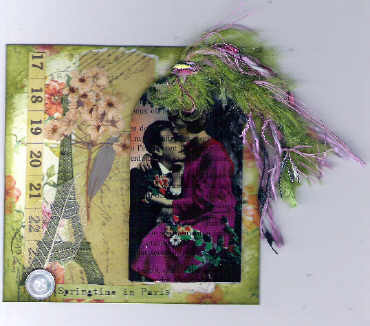 Debra Price used an image from the Beautiful Blues collage sheet and the gold French German scrap border for this ATC! 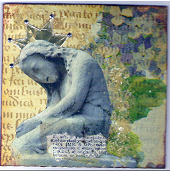 Debra Price used an image from the Beautiful Blues collage sheet and a gold German scrap mini crown for this ATC! 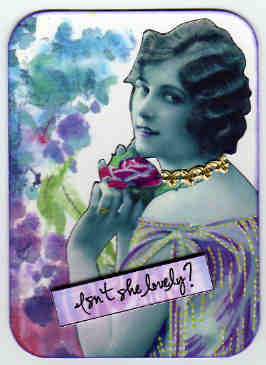 Debra Price used an image from the Beautiful Blues collage sheet for this ATC! 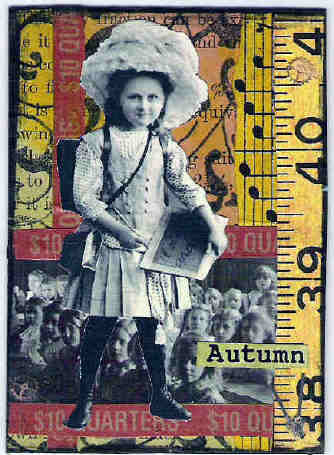 This ATC uses two images from the "Back to School" collage sheet, the Stylish Background Stamp, Vintage Book Pages and Vintage Sheet Music. 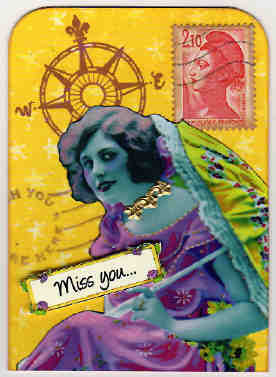 These altered postcards use images from the "Back to School" collage sheet, Bingo Markers #2, Vintage Book Pages, and Vintage Sheet Music. 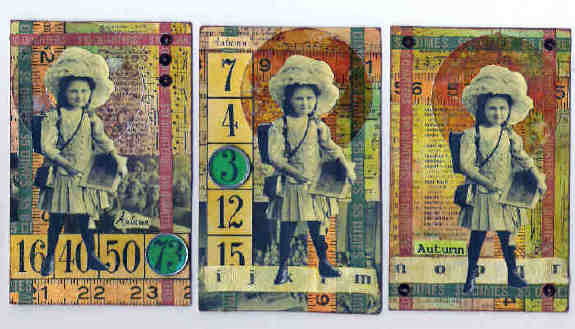 This ATC by Marcy Hudziak features the Precious Portraits collage sheet and vintage cigar trim labels. 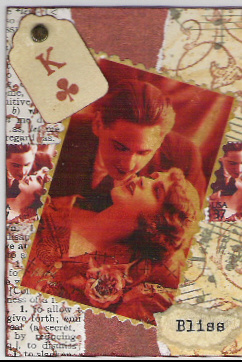 Wonderful 1 x 1" art submitted by Pat Condra. 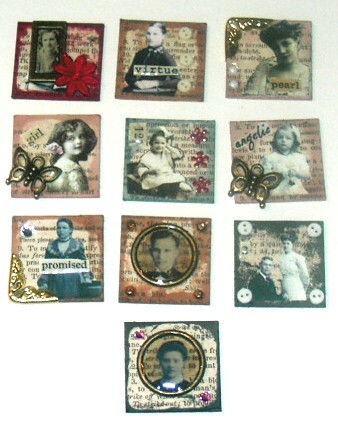 Pat used the "Charmed" collage sheet for these beauties! More 1 x 1" art!! 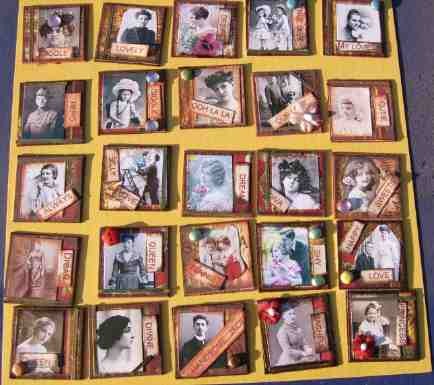 The "Charmed" collage sheet was used for these tiny pieces of art! 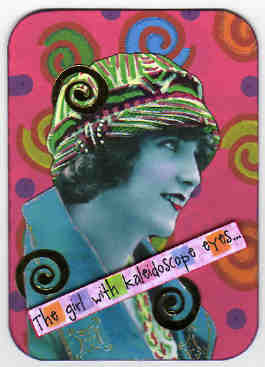 Items used for this project include a vintage optical lens (imperfect), Optical Lens Sampler #1 Collage Sheet, Vintage Sheet Music and Bingo Card Blanks! 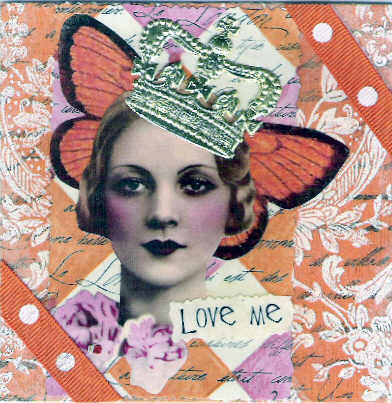 Four wonderful ATC's created by LuAnne B. LuAnne used several Collage Stuff collage sheets - Madonna, More Madonna, Altered Madonna, Altered London ATC. 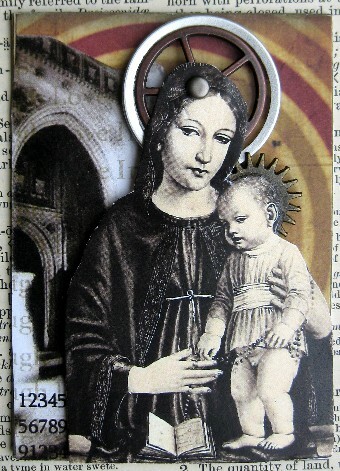 Tim Holtz sprocket gears and the retro grunge paper pack are used. Gold Scrolls and Copper Assorted German Scrap Stars are used for accents. Thanks for sharing your art, LuAnne. 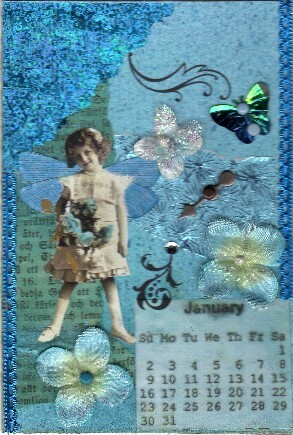 This calendar page by Susan K. uses the Celeste Collage Sheet, Light Blue Lace Border & Tim Holtz Game Spinners. 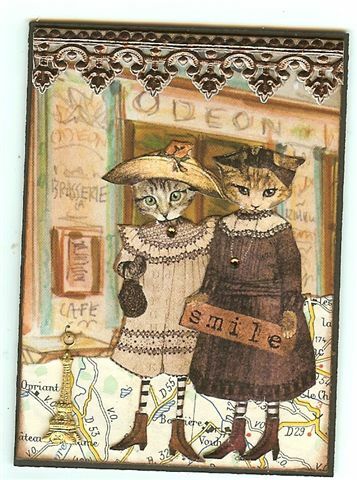 Many thanks to Phyllis T. for sharing her ATC's created using the Catnip Designs Little Kitty Sisters collage sheet. 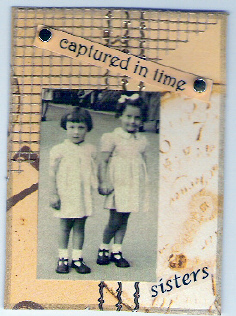 Phyllis has also used various German scrap borders, and UK bus tickets in these designs. 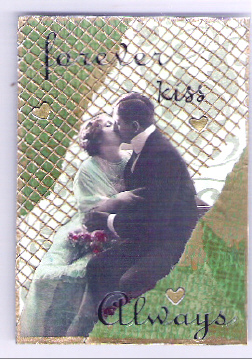 I made this chunky ATC sample! 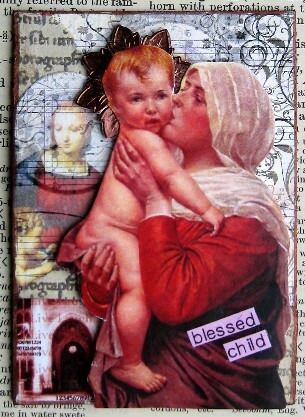 Click here to learn the details about constuction of this chunky ATC at the Collage Stuff blog!